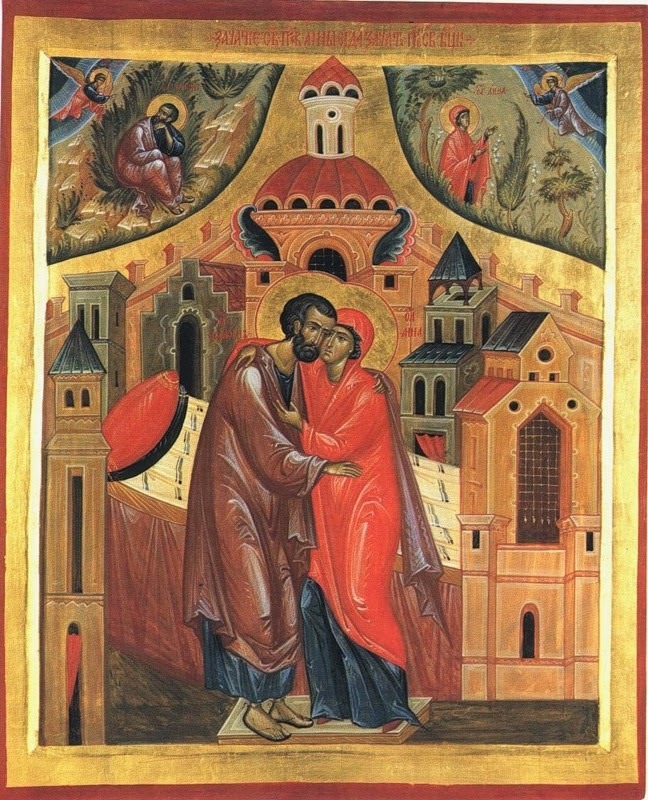 The Byzantine Rite celebrates the conception of the Virgin Mary under the title “the Conception (in the active sense) of St Anne”, on December 9th. This 18th century Russian icon depicts the traditional story that St Joachim (upper left) went out into the desert to mourn his and Anne’s barrenness, for the sake of which his offering in the temple had been refused. An angel then came to tell him to return to Anne, and that God would grant them a child who would become the Mother of the Savior. In the upper right, the same message is delivered to Anne herself. 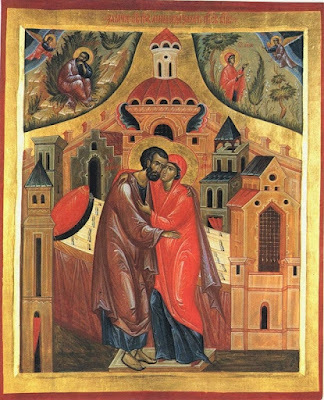 The legend goes on to say that they then went to find each other, meeting at the gate of Jerusalem called “the Golden Gate.” The depiction of their embrace and kiss is often used not only to decently represent the act of Anne’s conception, but to distinguish the Immaculate Conception of the Virgin from that of the virginal conception of Christ. This same legend was well known in the West, and referred to in many artworks and liturgical texts. The following three troparia are all taken from the third canon at Orthros of the same feast. From Thee, that art without stain of sin, receiving the Lord incarnate beyond the order of nature like a burning coal, we are purified from the fullness of transgressions. The mysteries of God’s hidden wisdom are truly made clear to us today, as the Conception of the immaculate Virgin and only Mother of God is proclaimed. He that is uncircumscribed in the immaculate bosom of the Father, in Thee, o immaculate Virgin, is carried about in the flesh, through His ineffable compassion; whence also He admits representation in an image, who is Good above all. From the canon of the Dedication of the Holy Sepulcher, celebrated on the same day. Thou alone among all generations, Immaculate Virgin, were shown to be the Mother of God; Thou hast become the dwelling place of the Godhead, that art wholly without blemish, and not burned by the fire of the unapproachable light; whence do we all bless Thee, Mary, bride of God.